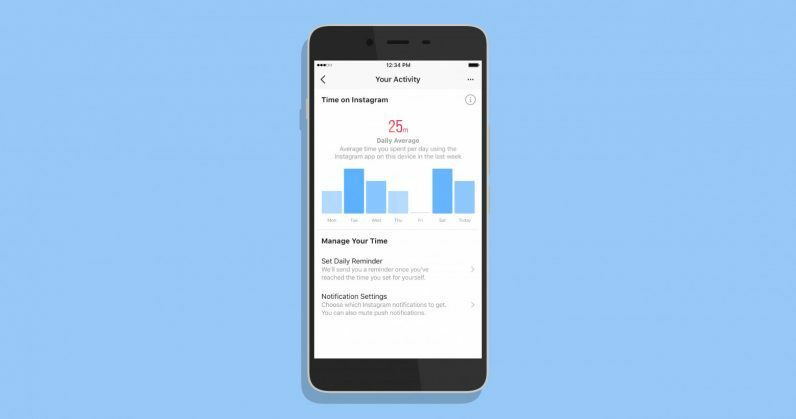 Like we anticipated in August, Instagram has rolled out a dashboard that lets you set daily time limits for using the app, and an option to temporarily mute push notifications. This is in line with the ongoing attempts by Instagram’s parent company, Facebook, to introduce new features in its apps to to help users fight social media addiction. The new feature can be accessed through the ‘Your Activity’ menu in the app, which you can find by tapping the hamburger icon in the top-right corner of your profile page. It’s available as a dashboard, and shows you the time you’ve spent in the app over the last week, along with an estimate of the average time spent every day. You can also set a daily time limit for the app; if you cross it, Instagram will alert you with a notification. The hard part is acknowledging the alert, and actually closing the app and going outside for a change. The dashboard also has a feature that lets you choose which notifications you want to receive, and also lets you mute push notifications. I think that the new features are a welcome addition because Instagram has had quite a history with social media addiction. Last year, a survey by the Royal Society for Public Health noted that Instagram was the worst social media platform for mental health. While Instagram scored points for self-expression and self-identity, the survey found that the app was associated with high levels of anxiety, depression, bullying and FOMO – the fear of missing out. Facebook is also expected to follow suit by launching a similar feature, but no official announcements have been made yet.